Three days ago, I visited Diagon Alley at the Wizarding World of Harry Potter in Orlando. I was acting a real fool the whole time, wide-eyed and full of awe at the impressive creation of Ollivander’s, The Leaky Cauldron, Knockturn Alley, and all the other minute details put into this small but extraordinary part of Universal. 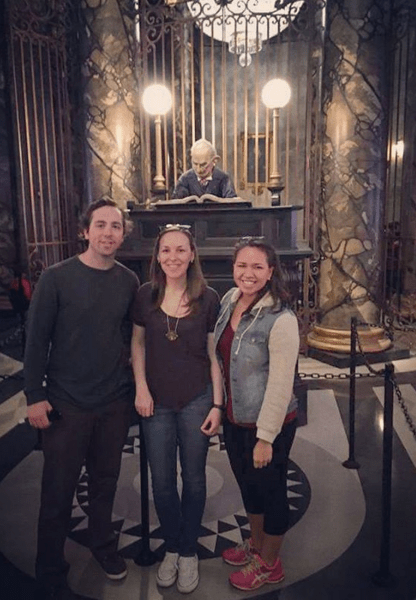 Supportive friends while unsuccessfully suppressing my utter glee inside Gringotts. The first order of business was to go on the Harry Potter and the Escape from Gringotts ride. The first time around was both thrilling and a bit of sensory overload (in a good way). The second time, I was able to really process what was going on, and realized that, quite literally, my childhood dreams were coming true. It was hard for me to contain my happiness, and my awesome friends were very patient with me. Anyone who knows me for more than roughly 5 seconds, knows I am a die hard Harry Potter fan. I read my first book in sixth grade and grew up with the characters, waited in line for the midnight premieres of the books and movies (as soon as my mom would let me), stayed up most of the night and hid indoors finishing Deathly Hallows in one day (so as to avoid any spoilers), visited the London studio tour, saw a double feature of the Deathly Hallows films (part 1 at 9 PM, and the premiere of part 2 at midnight), and recently spent an exorbitant amount of money on tickets 18 months down the road to see Harry Potter and the Cursed Child, 3,000 miles away. My point in all this is that Harry Potter—and I’m talking about the story as a whole, not just the character—is very much a part of my identity. It is, relatively speaking, a big part of who I am. It has been an ongoing source of happiness, escape, comfort, and fond memories with friends, family, and own imagination for most of my life. Here is the obligatory and slightly awkward “welcome to my blog” blog post. So, hi. I can’t imagine anyone reading this is a complete stranger, so I won’t bother with an introduction of who I am. You may be wondering, however, why this blog popped up on the Interwebz in the first place.